The late great Anthony Bourdain once wrote, “Garlic is divine. When handled correctly, few foods can taste so many distinct ways. Please, treat your garlic with respect…” While he was referring to garlic’s culinary uses, we will see here that the same is true of its herbal and medicinal uses. In the previous issue, we highlighted the power of Lobelia. Garlic is another one of my favorite herbs. Since the holidays are coming up and the cold and flu season is upon us, it’s garlic’s turn to shine. 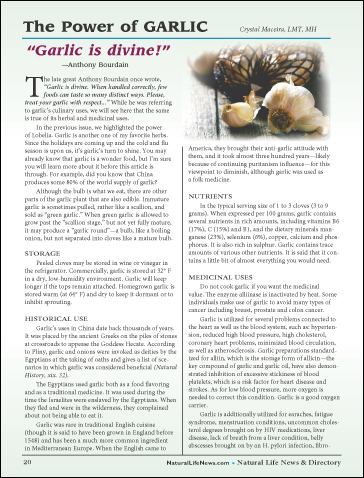 You may already know that garlic is a wonder food, but I’m sure you will learn more about it before this article is through. For example, did you know that China produces some 80% of the world supply of garlic?